Sat 8:30 a.m. 4:30 p.m.
RMI 632 P is capable of maintaining a mowing area up to 1 acre (4,000 m2), even slopes and gradients up to 45% will be no match for this reliable robot featuring a 27 cm (11") hardened mulching blade. Simply program a schedule that works for you… and you're done! iMow handles the rest, leaving you to relax and enjoy your consistently manicured lawn. On board rain sensor can be calibrated to your unique needs and built-in sensors will detect and avoid obstacles and impasses. iMow® is available in limited regions of Canada and sold and serviced at specially trained and authorized Dealers. Use the STIHL Dealer Locator to find your nearest iMow® Dealer. Featured price does not include installation. Bright LCD display: Not only can all the necessary settings be entered intuitively via the screen, thanks to its high-contrast, bright display, it can also be used in strong sunlight. On the MI 6 models, the display can also be removed as a console to facilitate programming without having to bend down. 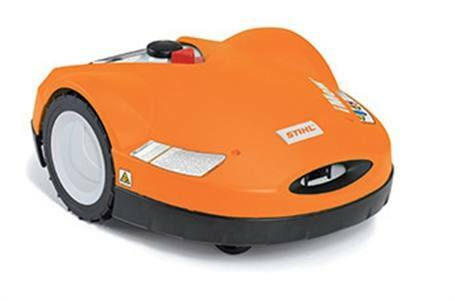 Movable hood: The hood of the iMow robotic mower is movable and features sensors for detecting obstacles. If the machine bumps against an obstacle, the impact forces are deflected along the hood and the robotic mower immediately changes direction. If the hood is lifted, the blades stop. (604) 590-1433 13399 72 Ave. Sat: 8:30 a.m. - 4:30 p.m.